Argentinian-born bassoonist Julia Harguindey joined the Nashville Orchestra as principal bassoon at the beginning of the 2016/17 season. She is also the newly appointed principal bassoon of The Santa Fe Opera orchestra. Ms. Harguindey has performed extensively as guest principal bassoon with Les Violons du Roy (Québec) and has previously played with I Musici de Montréal, the Métropolitan Orchestra, Montréal Symphony Orchestra, Trois-Rivières Orchestra (Québec), and most recently as the guest principal bassoonist of the Atlanta Symphony Orchestra. 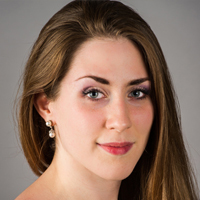 Ms. Harguindey is the first prize winner at the 2015 Prix d’Europe Woodwind Category, second prize winner at the 2014 OSM Standard Life Competition, and a recipient of the 2012 and 2014 Sylva Gelber Foundation Career Grant. She has attended the Pacific Music Festival, Domaine Forget, and the Orchestra of the Americas. Ms. Harguindey was recently invited by the Curtis Institute of Music to participate in a joint collaboration between Curtis and the Fundacion Azteca in a series of concerts and master classes throughout Mexico. Following immigration to Montréal in 1991, Ms. Harguindey studied at the Conservatoire de Musique de Montréal and subsequently at Curtis. Her teachers have included Mathieu Harel, Eugene Izotov, and Daniel Matsukawa.